You’re coughing, your muscles ache and you have a fever. Is it the flu? Or a cold? How can you possibly tell? 1. High fever is associated with the flu. While people with colds might feel hot, a fever of 102 degrees or higher often signals that a person has the flu. “When I see a higher fever, I think first about influenza,” Cennimo said. Dr. Donald Middleton agreed that high fever is a telltale sign someone's grappling with flu. “Most of the time you can’t tell. 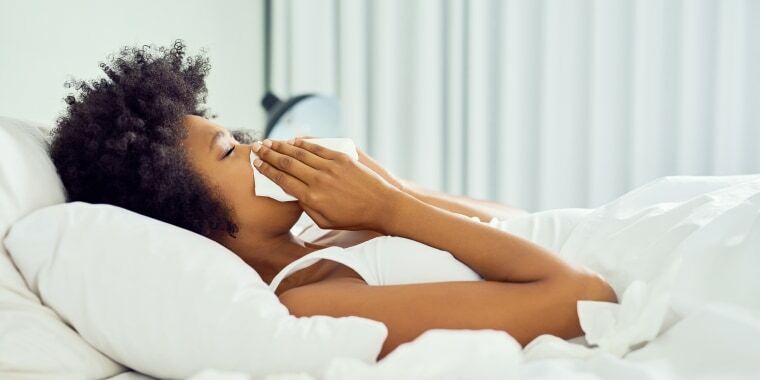 But if you get a high fever of 102 or 103 and severe sore throat and cough that won’t stop, it can be flu,” the family medicine doctor at University of Pittsburgh Medical Center told TODAY. Even though a cold makes people feel miserable, they normally improve without a doctor’s help. “Colds are usually self-healing,” Middleton explained. But sometimes flu requires antiviral medications or hospitalization. It's important to note that the flu can be fatal. The Centers for Disease Control and Prevention (CDC) reported that the 2017-2018 flu season was a high severity season across all age groups. As of late October 2018, 185 pediatric flu deaths had been reported, and 80 percent of those deaths occurred in children who had not received the flue vaccine. When people develop a cold, it normally starts slowly with mild sniffling, sore throat or congestion for a few days. Then it worsens. With flu, it occurs suddenly. People often feel great and then abruptly feel sick. Dr. Antonio Crespo, an infectious disease specialist at Orlando Health, agreed. 4. Body aches, sore throat and headache mean flu. “Influenza tends to be associated with more coughing, more myalgia (body aches), the fatigue, more headache. (With) the common cold, you would have more people complaining of nasal congestion, runny nose, sinus congestion. Less likely to have fever. Less likely to have body aches,” Cennimo said. “The common cold tends to be milder than influenza,” Crespo said. 5. The flu lasts longer and comes with complications. For the most part, a cold will last about three to five days, then people start feeling better. But anything lasting five or more days could be the flu. “The influenza lasts a little longer than the common cold,” Crespo said. People can also develop complications, such as pneumonia and strep throat, more often with the flu. If you think you might have the flu, you should visit your doctor as soon as you can.